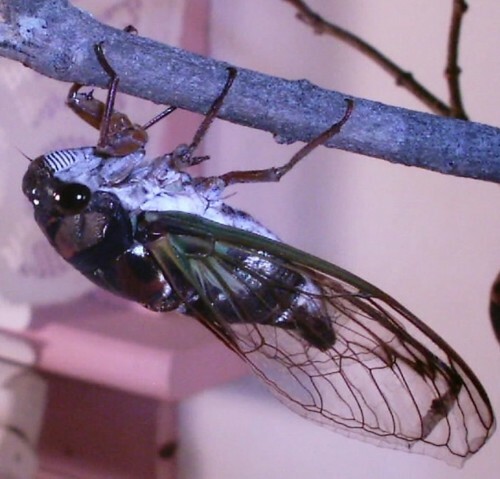 Back in the 1970's when I discovered my first cicada and started reading up on them, books of that era made note of the fact that Cicadas did not feed when they were adults. Their sole primary function when living above ground was to perpetuate the species by reproduction as their life span as adults was 7 to 10 days maximum. This of course was later proved to be false. In fact, Cicadas do indeed feed above ground. 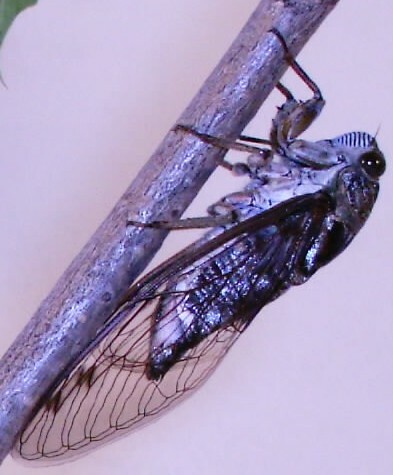 Cicadas have a unique mouth part for feeding known as a beak. It is a stylus-type protuberance used for piercing the xylem in small twigs in trees and bushes to withdraw water, minerals and limited carbohydrates. 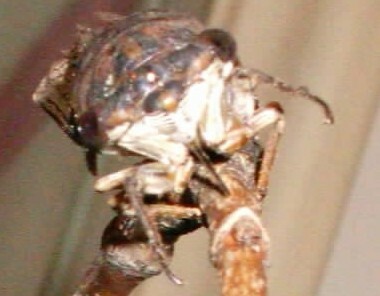 When a Cicada is not feeding this beak rests ventrally between the legs. The Cicada's beak is actually made up of mandibles, maxilla, a salivary channel and an outer labium. It's this labium that you can see. 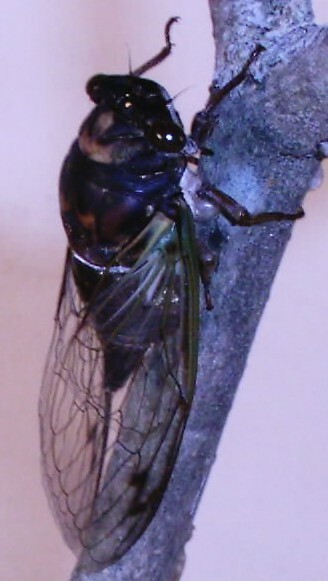 It is believed that feeding for Cicadas serves two purposes. One is for nutrition and the other is to aid in the regulation of body temperature by way of evaporative cooling on long hot summer days. During the hottest part of the day in summer you may notice that male cicadas stop calling. This is probably due to feeding during that time. Cicadas actually work their beak into a branch for feeding by slowly rocking back and forth from left to right and sometimes up and down. 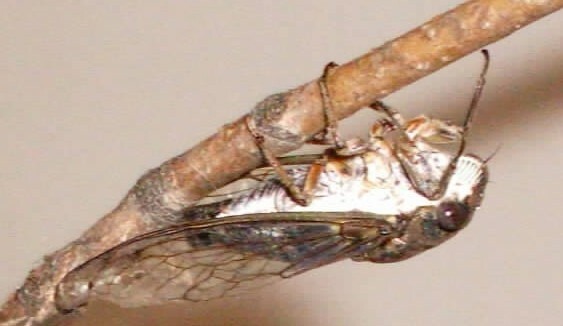 Cicadas can feed up to several hours. While observing Cicadas feeding, an unusual behavior has been noted. As the pictures below indicate several specimens of both T. lyricen and T. canicularis actually raise their front forelegs in the air and maintain this position while feeding. Position doesn't seem to matter. 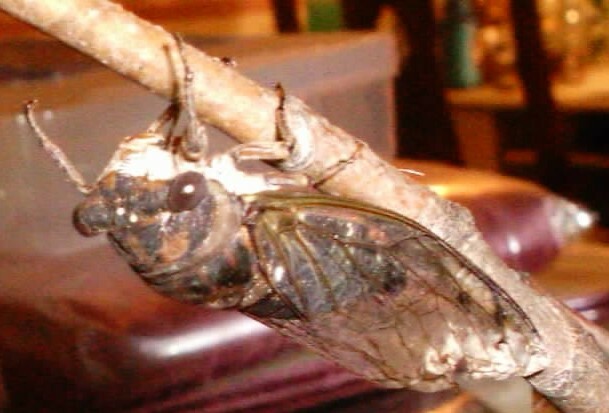 Whether the Cicada is resting on top of a branch or below a branch, the same behavior has been noted. When handling a Cicada, it sometimes can mistake it's handler for a branch and attempt to feed on you. There is a slight pressure at the point where the Cicada attempts to insert it's beak into your skin. It doesn't usually draw blood. However, I try to avoid allowing a Cicada to do this because I fear pathogens may be carried from the Cicada to me should the Cicada succeed in breaking the skin when attempting to feed. It is unclear if Cicadas have a particular food preference. 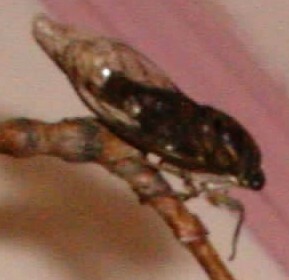 The Cicadas that I studied in captivity fed on lilac or maple branches emersed in water. The maximum amount of time these specimens lasted in captivity was 7 to 10 days. An interesting experiment for future would be to see if Cicadas had a preference for feeding on representatives of their host plant. 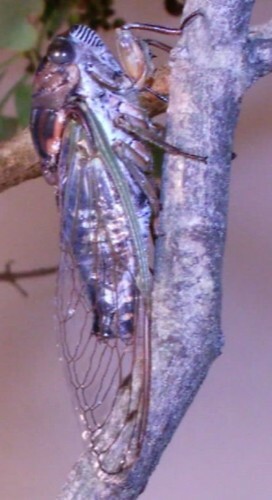 For example, if a Cicada developed below ground as a nymph feeding on xylem of an Ash tree, would the same nymph, as an adult only prefer the branches of an Ash tree? How far would they wonder from their original host plant as an adult? We are supposed to make a project on cicadas, and I think this website will help me a lot. Thanks for your help! If you have any questions for your cicada project, feel free to ask.